Exceptional comic art and related works went under the hammer at Artcurial in Paris, last weekend (June 5), including Tintin creator Hérge and other legendary artists. 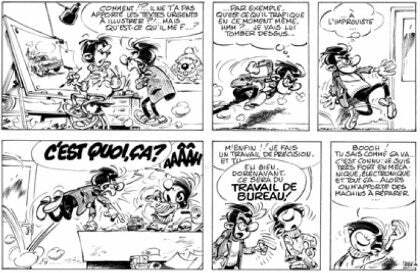 Leading the auction was a 1970 strip featuring Gaston Lagaffe, a lazy and accident-prone office junior (his surname means "the blunder"). Belgian comics artist André Franquin created Gaston in 1957, whose subsequent popularity lead to it becoming an institution in France and around Europe. The strip for sale at Artcurial was originally published on page 15 of the comic book "Lagaffe nous gate," the eighth book of its series. The excellent-condition strip was estimated at €35,000-40,000, and eventually sold for a final price of €42,000. 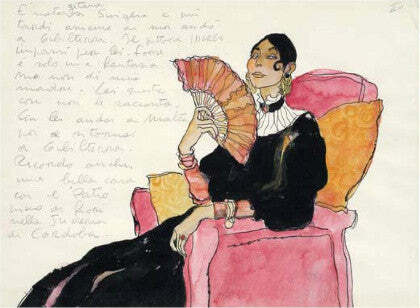 Another big seller at Artcurial was Le Mere De Corto Maltese by Hugo Pratt, circa 1970. Measuring 30 x 25cm, the work is probably the only known watercolour depicting the mother of Corto Maltese, Pratt's famous and popular sailor adventurer. Billed as "one of the most one of the most beautiful watercolours of this period," Pratt's work surpassed its lower estimate of €30,000, finally realising €37,535.